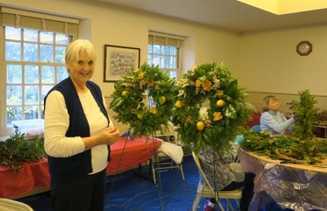 Every year, dozens of Arasapha members and other volunteers participate in a beloved decades-old New Castle tradition: decorating over 100 all-natural wreaths that adorn the Historic District's public buildings and businesses during the holiday season. Arasapha members also create all-natural holiday decorations for Fezziwig's Ball and Victorian Teas sponsored by New Castle Historical Society. The wreaths, decorated with dried flowers and fresh fruits, vegetables, and greens, contribute to the Historic District's charming holiday atmosphere enjoyed by visitors and residents alike. Arasapha's annual Holiday Greening project is supported by grants from the Trustees of New Castle Common and the City of New Castle, along with proceeds from A Day in Old New Castle. New Castle's holiday greens are created at two events each year: the Gathering o' the Greens and Wreath Workshop. You don't need to be an Arasapha member to join the fun! Keep reading for more information on each event. Click here if you have any questions. On the Saturday through Monday after Thanksgiving, we forage through forest and fields, clipping and gathering fresh greens to adorn the wreaths. Bring your garden clippers, and dress appropriately for the weather! If you have tarps or a sturdy ladder, bring those too. Click here to ask about this year's hours. On the Wednesday and Thursday after Thanksgiving, we decorate all-natural holiday wreaths. We start by bundling dried flowers onto flower picks so they can be easily attached to wreaths. Then we used dried flowers and fresh fruit, vegetables, and greens to decorate the wreaths. ​You don't need to have any artistic talent to join the fun! Stop by anytime the Wreath Workshop is open, for as long or as little as you like, and we'll show you what to do. (Wednesday evening is great if you work during the day.) Bring garden clippers if you have them. If you like, for a modest fee you can create a beautiful wreath for your own home. We can advise you on how to create the look you want. Click here to request more information.